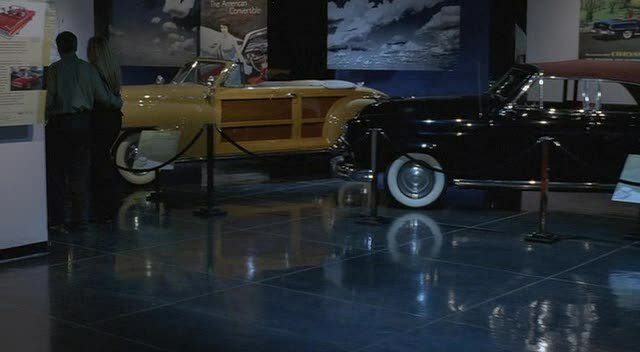 IMCDb.org: 1948 Chrysler Town & Country [C-39] in "Crash and Burn, 2008"
The wood makes me think Chrysler Towns & Country, but the front fenders don't. For me it looks OK as a T&C (1946-1948); one can just see that the front fenders continue into the door, the front of the door seems to be straight because of the angle of the pic. This car was originally owned by actor Duncan Renaldo who played the Cisco Kid in movies and TV in the 40s-50s. Several web sites identify it as a 1948 Chrysler Town and Country. Yes, it's a '48 Chrysler Town & Country. But far more interesting to me is the car to the right. Is that an extremely rare '51 Frazer 4 door convertible?